You can't spell “fundraiser” without “fun”, and we'll help you make sure your event is upbeat and exciting. 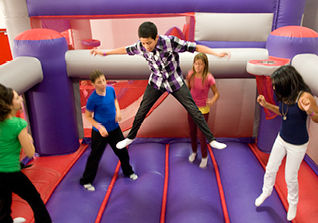 Is your group looking for a fundraiser that is fun, healthy, safe, profitable and hassle free? Your guests will love our food, our atmosphere, and our bounce structures - and, of course, your organization gets to keep a portion of the proceeds. We are proud to support schools and non-profit organizations in our community.